The NZMEC was established in 2015 from former refugee ethnic group originally from Myanmar (Known as Burma). The NZMEC is formed by the major eight ethnic groups from Myanmar. They are Kachin, Karenni, Karen, Chin, Mon, Bamar, Rakhine and Shan. The aim of the NZMEC is to maintain our traditional cultural dance, music, and language and share with wider communities in New Zealand. The Chin youth group will be performing Chin cultural dance and the homework club group children will be performing a group song. Our homework club student Zung Bawn will be playing a piano solo. The CK Foundation guitar lesson student group also will be performing guitar solo and music performance. The CK guitar lesson is led by Thim Kim Thang Thangpawl (Know as Kim). 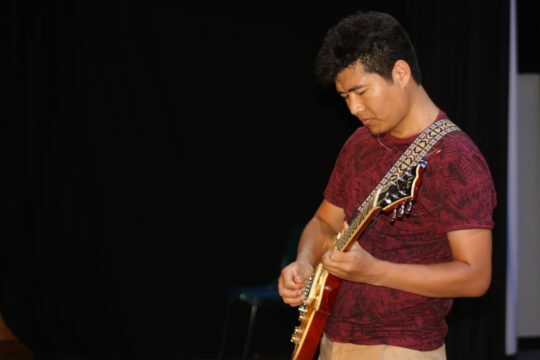 Kim is a young musician from Myanmar who is passionate and enthusiastic in teaching guitar lesson to all ages especially to young children to pass his musical talent as he finds music as a healing and relaxing therapy.